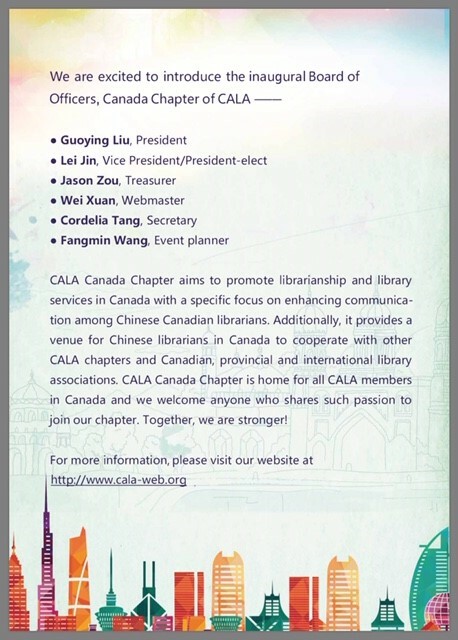 CALA Canada Chapter aims to promote librarianship and library services in Canada with a specific focus on enhancing communication among Chinese Canadian librarians. Additionally, it provides a venue for Chinese librarians in Canada to cooperate with other CALA chapters and Canadian, provincial and international library associations. CALA Canada Chapter is home for all CALA members in Canada and we welcome anyone who shares such passion to join our chapter. Together, we are stronger!